Description: This is an Introductory Tutorial to the Fast-RTPS and Micro-RTPS protocols for RTPS (Real Time Publish Subscribe) as used in robotics and extremely constrained devices. The enablers of the FIWARE platform are not directly involved at this low level of communication but a complete understanding of the protocols is required before proceeding to connect robotic devices to the FIWARE System. The tutorial introduces a series of exercises which can be run directly from within a Docker container, no HTTP calls are required. eProsima Fast-RTPS is a C++ implementation of the RTPS (Real Time Publish Subscribe) protocol, which provides publisher-subscriber communications over unreliable transports such as UDP, as defined and maintained by the Object Management Group (OMG) consortium. RTPS is also the wire interoperability protocol defined for the Data Distribution Service (DDS) standard, again by the OMG. eProsima Fast RTPS holds the benefit of being standalone and up-to-date, as most vendor solutions either implement RTPS as a tool to implement DDS or use past versions of the specification. eProsima Micro-RTPS protocols for RTPS (Real Time Publish Subscribe) as used in robotics and extremely constrained devices, which is a software solution that provides publisher-subscriber communication between eXtremely Resource Constrained Environments (XRCEs) and a DDS network. In particular, Micro-RTPS implements a client-server protocol to enable resource-constrained devices (clients) to take part in DDS communications. Micro-RTPS agent (server) enables possible this communication by acting behalf of Micro-RTPS clients and enabling them to take part as DDS publishers and/or subscribers in the DDS Global Data Space. The goal of this section is to provide you with a simple getting started guide on how to install and use Fast-RTPS. In the subsequent tutorials we will discuss how Fast-RTPS (and therefore ROS2) can be connected to the Orion Context Broker using FIROS2. At this point, you have Fast-RTPS installed in the Docker container environment. We can now run a Hello World example. In the example, we will send a set of messages from a publisher to a subscriber using the Fast-RTPS protocol, as shown in the figure. To leave the containers and end interactive mode, run the following in each terminal. You will then return to the command-line. Other examples are available in the examples folder, which are beyond the scope of this tutorial. For more information, please refer to the official Fast-RTPS documentation. The goal of this section is to provide you with a simple getting started guide on how to install and use Micro-RTPS. At this point, you have Micro-RTPS installed in the Docker container environment. We can now run a Hello World example. 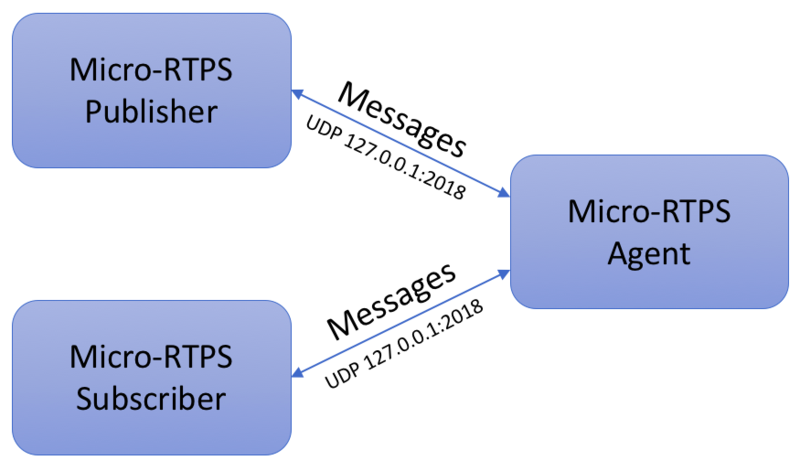 In the example, we will send a set of messages from a Micro-RTPS publisher to a Micro-RTPS subscriber through a Micro-RTPS agent, as shown in the figure. Other examples are available in the examples folder, which are beyond the scope of this tutorial. For more information, please refer to the official Micro-RTPS documentation.